Sidney Slon/Pipe Dream Photographer Freshman guard Sam Sessoms carried a sluggish Bearcats offense Saturday afternoon, putting up 19 points in a blowout loss to Vermont. 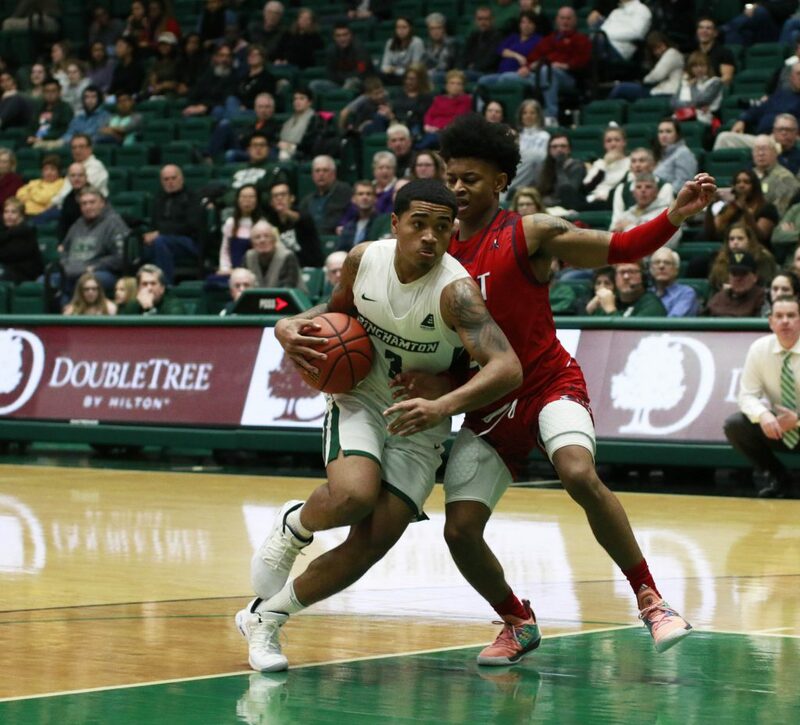 After capturing its America East (AE) opener for the first time since 2011, the Binghamton men’s basketball team has dropped three straight road games against its conference foes, culminating with a 78-50 defeat to the heavily favored Vermont Catamounts on Saturday afternoon. The Catamounts (15-4, 5-0 AE) have been the dominant team in the AE for the last several years. The defending regular season champions were picked first this season in the preseason poll after being upset by UMBC in last year’s conference championship game. Vermont has won six straight matchups against the Bearcats (5-14, 1-3 AE), with Binghamton’s last win against UVM coming in 2015. Before missing much of conference play last season due to injury, junior forward Anthony Lamb led the Catamounts to a conference title as a freshman and was named the AE Tournament’s most outstanding player. His 20.6 points per game currently leads the conference, but Lamb was held in check by Binghamton throughout the game, scoring just eight points. Vermont’s depth showed with the strong performances of a trio of brothers. Redshirt senior guard Ernie Duncan posted a game high of 20 points, and redshirt junior guard Everett Duncan was second on the team with 13. Freshman guard Robin Duncan locked down freshman guard Sam Sessoms defensively during the first half, holding BU’s leading scorer to just six first period points. After a lackluster first-half performance by BU, the Catamounts took a 36-14 lead into the locker room at halftime. Even though the Bearcats went on to post 36 points in the second half, the Catamounts poured in 42 in what ultimately became a 78-50 blowout win for Vermont. The second-half improvement by BU was not nearly enough to stage a comeback. “I thought our guys played a pretty good second half where, after really struggling offensively, we found some traction,” Dempsey said. Despite struggling early in the game, Sessoms led the Bearcats in scoring with 19 points, markedly improving in the second 20 minutes. After cruising to a win over New Hampshire in its conference opener at the Events Center, Binghamton has struggled against three of the premier teams in the conference on the road, falling to Stony Brook (16-3, 4-0 AE), UMBC (11-9, 3-2 AE) and Vermont. “We’ve played the toughest schedule of anyone in the league so far, so we can’t get discouraged,” Dempsey said. The team’s 50 points scored in a losing effort against Vermont was BU’s highest points total during the road trip. The closest margin of defeat was 13 points against the Seawolves. The Bearcats return home as they continue conference play against UMass Lowell Wednesday night. Tipoff is set for 7 p.m. from the Events Center in Vestal, New York.